Back to Port Alberta at YEG. 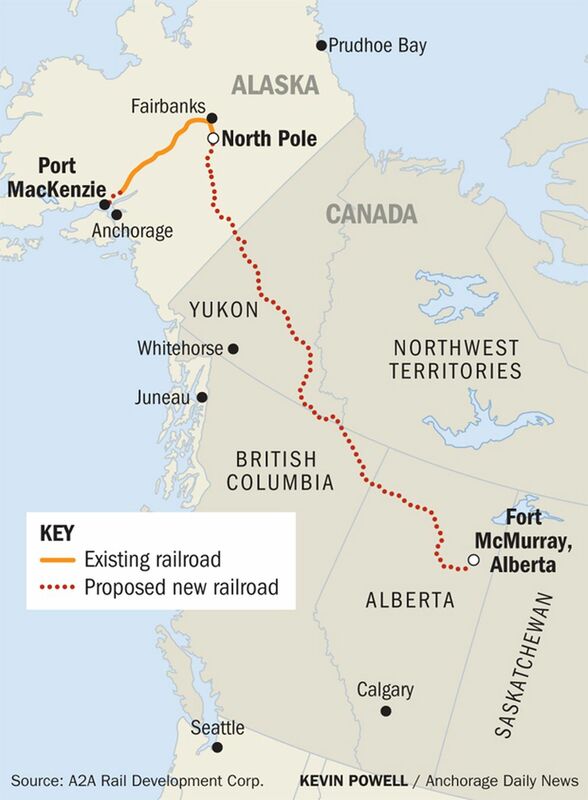 Maybe with the further expansion of CP Rail yards nearby, is there is an opportunity of some sort for Port Alberta (certainly there will be for Edmonton Metro) with the Alaska Governors request to President Trump to allow by Presidential Permit a new rail line to Alberta and points south into the lower 48. Though the Governor mentions also carrying passengers that ought to be interesting. The question is going south from Fort MacMurry is the line CN or CP? Going NE to Alaska it will surely be a blend of Alaska, First Peoples and who knows what else ... if this ever gains traction. 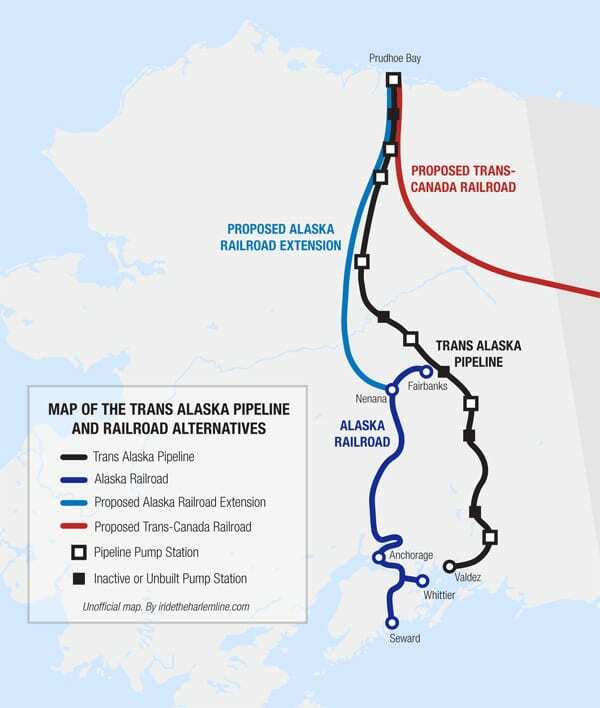 "Alaska's governor has asked U.S. President Donald Trump for permission to extend an Alaska rail line into northern Alberta, according to officials. ... The rail extension would reduce travel time by at least two days for Canadian and Lower 48 trains with cargo bound for the Far East, according to supporters of the initiative. Railcars would carry passengers and freight, including bitumen — a semi-solid, tar-like form of crude oil — potash used in fertilizer, and ore from mines. That would be an amazing train trip! It's a proposed first phase of an ultimate (also proposed) link above.below the Bering Straight to Russia. Might be all pie in the sky - probably is - but intriguing none-the-less. Bering straight is definitely pie in the sky but moving bitumen through Valdez has at least some business case for it. Still a long shot considering the politics involved but definitely doable. I could see this head up through Whitehorse and then on to Alaska. Hauling commodities along that route could be cheaper but the engineering along that route may be costly. I also heard that oil production on the North slope was down so shipping through Valdez would give it a bit of an economic boost. It would also bypass the moratorium on tankers on the Canadian West coast. Running the rail line across the Top of Alberta puts you in some very muskegy land. That is about the same distance from Edmonton to Eugene, Oregon. its unclear which "updated" report the Governor will use to discuss this with President Trump. A 2015 study by the Van Horne Institute, which was commissioned by AECOM, examined a Fort McMurray, Alberta to the Port of Valdez, Alaska line for carrying bitumen, petroleum and other products. Covering 1,525 miles (2,440 kilometres), the estimated capital cost was $28–34 billion depending upon the volume of product shipped. Annual operating costs are estimated to be $1.9 to $2.3 billion per year for 1.0 mbpd and $2.7 to $3.5 billion for 1.5 mbpd. At $28–34 billion, that is effectively double of the previous study. Knowing how consultants work. Double those costs again. Does $56B to $68B sound like a good idea? Fortunately, and please correct me if I read the Governors comments incorrectly, but he sees all or most costs coming from Alaska sources. This is also about freight from Alaska moving by rail to the lower 48. This is interesting, definitely worth a beard stroke or two.